Hendon FC claimed an important victory at Hampton & Richmond Borough to lift themselves to within four points of the Isthmian Premier Division playoff places. The defeat all but eliminates Borough’s fading hopes of finishing in the top five. Hampton’s horrendous home form continued on a freezing night at Beveree Stadium, extending their winless run in front of their own supporters to six league games. Incredibly, that small number of games stretches back all the way to a single goal win against Whitehawk on October 13th! Mark Harper made a couple of changes to his lineup; Malvin Kamara was restored to the starting eleven, while Gary Holloway was missing through illness. Joe Turner reverted to central midfield after playing at right back in Saturday’s defeat at Margate. The Beavers started off brightly, and had the better of the game for the opening quarter of the match. As early as the fifth minute, Charlie Moone hit a lovely dipping volley that dropped on the roof of the net. Joe Turner, possibly Hampton’s most consistent player other than Moone this season, had three efforts inside the first twenty minutes. First, a well worked free kick saw Moone set up Tony Taggart. His shot was blocked, and the loose ball fell to Turner, who drilled his shot wide of the left hand upright. Then, on the quarter hour, he showed some lovely trickery to get into a shooting position, but his effort was tame and easily saved. On nineteen minutes, he poked an effort wide from the edge of the box. The visitors started the second half in the same dominant fashion they ended the first, with Belal Aite-Ouakrim firing over early, before Dean Cracknell headed straight at Chiweshe when it looked easier to score. Alan Bray then presented Hendon with a gilt-edged chance, when he slipped in possession, allowing Morias to break into the penalty area. He drilled the ball into the six yard box, but Jeffreys cleared the ball away from onrushing attackers. 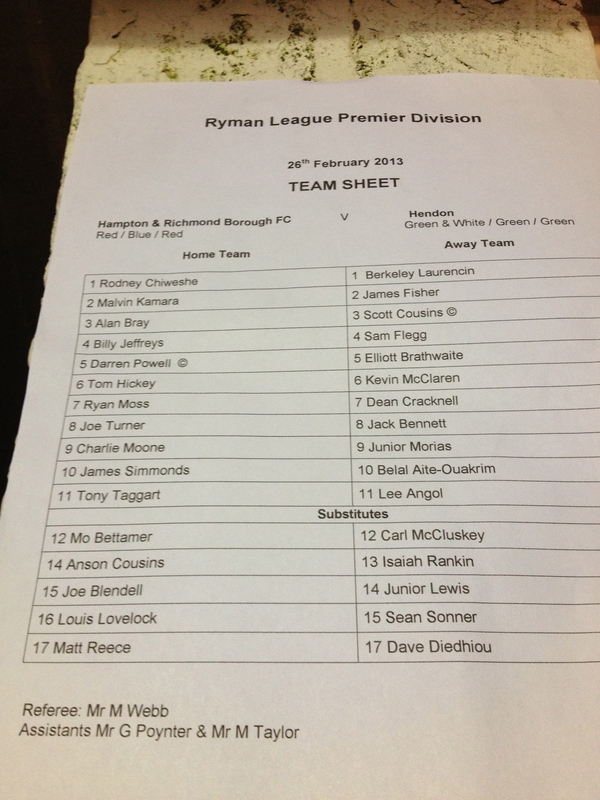 Posted on February 27, 2013, in UTL Archive and tagged Charlie Moone, Hampton & Richmond Borough, Hendon FC, Isthmian Premier, Junior Morias. Bookmark the permalink. Leave a comment.